As you probably know by now after reading a few of my recent posts, I am back on the Weight Watcher’s Plan. I seriously believe that it’s the best diet plan out there and gives you the most freedom to eat within your lifestyle and still lose weight. Being that it’s really tough for me to reduce my portion sizes and restrict the types of food that I have become so accustomed to eating, I went on an online search for some filling and tasty recipes that also have low Weight Watchers Points Plus values. 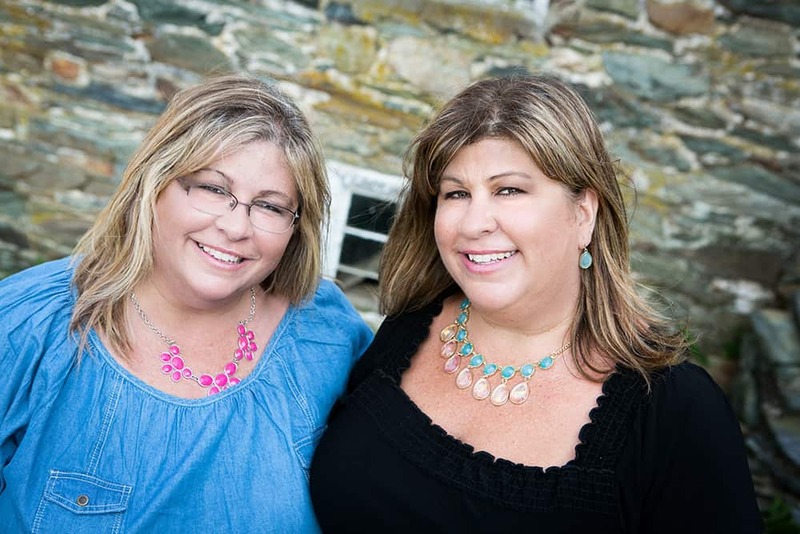 One site that I’m so happy I found is called Skinny Kitchen with Nancy Fox. Nancy Fox has been extremely successful in her quest to offer healthy foods to the public. She’s been on TV, has restaurants, has a successful gift basket company, has been featured in magazines, and is a book author. Wow! Talk about credentials. And the best part is – she gives the Weights Watchers Points Plus Values for all of her recipes. Needless to say, I have subscribed to her website so that I can get all of her delicious recipes delivered straight to my inbox as soon as she posts them. 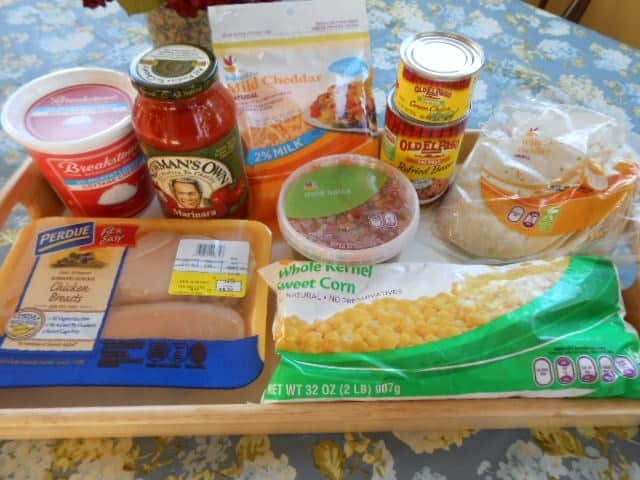 One recipe that looked really tasty to me is her Skinny Lasagna Ole. At first I was thinking it would be a skinny version of the italian lasagna we all know and love. 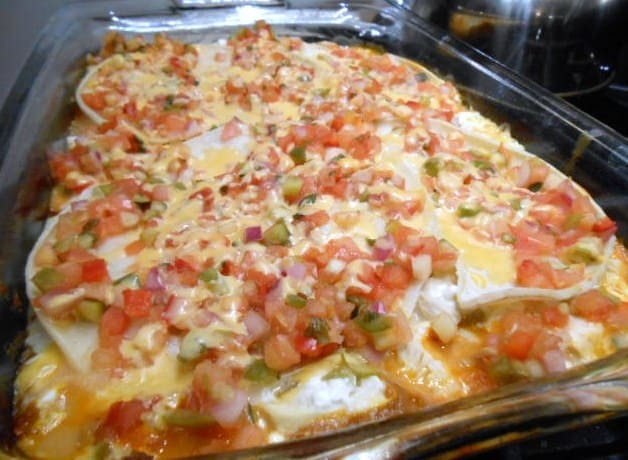 But after reading the ingredients, I realized that it’s more of a mexican, almost enchilada type of dish. Hence the Ole reference. Don’t worry though, she does have a recipe for the more traditional lasagna recipe as well, just skinnied up. Preheat oven to 350 degrees. Coat a 9” square pan with cooking spray. 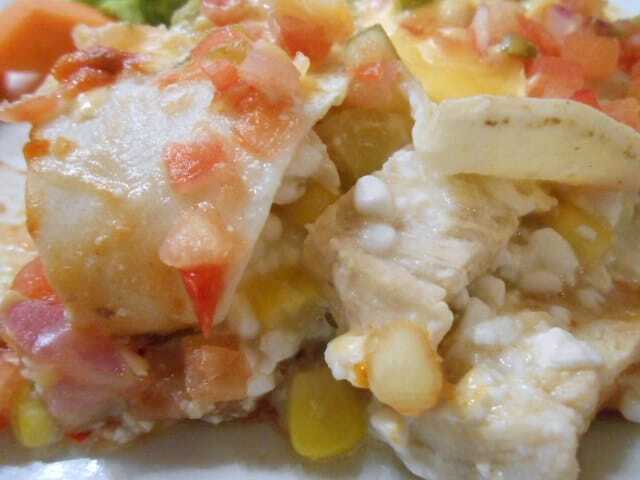 In a large bowl, combine cottage cheese, chicken, corn and green chilies. Spread pasta sauce on bottom of pan. Remove the beans from can, place in a small bowl and soften in the microwave for easy spreading. Spread the re-fried beans evenly on the tortillas. Arrange 2 more tortillas (8 pieces) over beans. Spread cheese mixture evenly over the tortillas. Cover pan with foil and bake for 30 minutes. 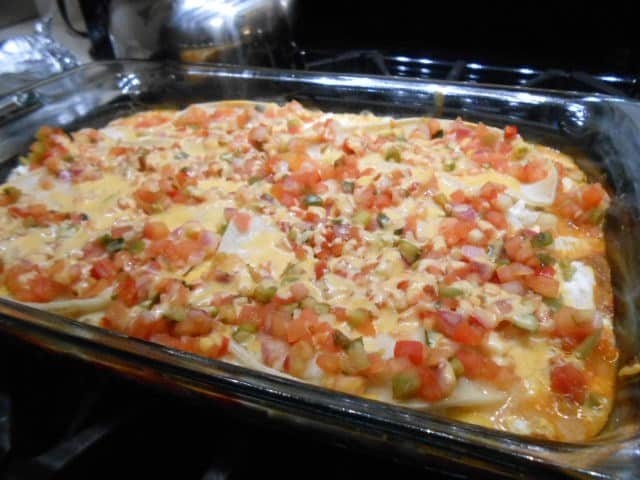 Remove from oven and place the last cut tortillas on top of casserole. Spread the salsa evenly over tortillas. Sprinkle cheddar cheese evenly on top. 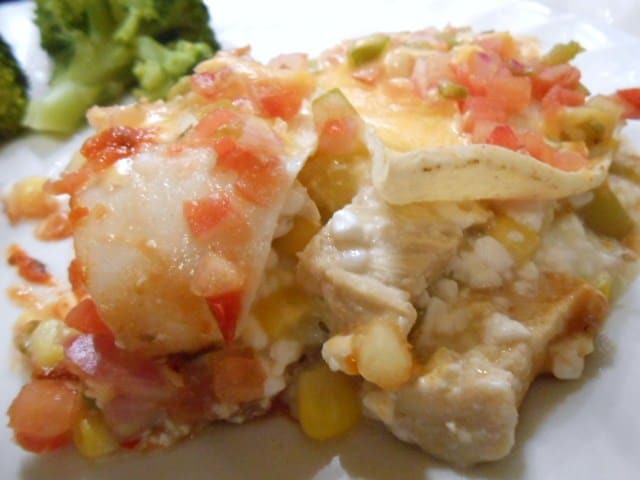 Cover casserole and bake 15 minutes longer. Cool slightly and cut into 6 slices. I happened to use a larger rectangular pan and not the recommended 9″ square pan. Next time I will use the 9″ square pan because the rectangular pan made it not as thick and the layers were harder to spread across the entire casserole. But boy was it good!! My son, who says he doesn’t like to eat anything ‘all mixed up’ wouldn’t touch it. Because of this, I set aside some of the boiled chicken and cut it up into pieces for him to eat with some rice and broccoli. However, my husband, who is pretty traditional when it comes to the types of food he likes to eat, actually went back for seconds. Yay! And don’t be alarmed when you see the amount of calories and grams of fat in this dish. It’s a 6 point Weight Watchers Points Plus value. If you follow the Weight Watchers plan, you’ll know that this is a decent points plus value for a dinner entree. The best part was that I had a good amount leftover and was able to enjoy it the next day for lunch. It’s very satisfying and delicious. 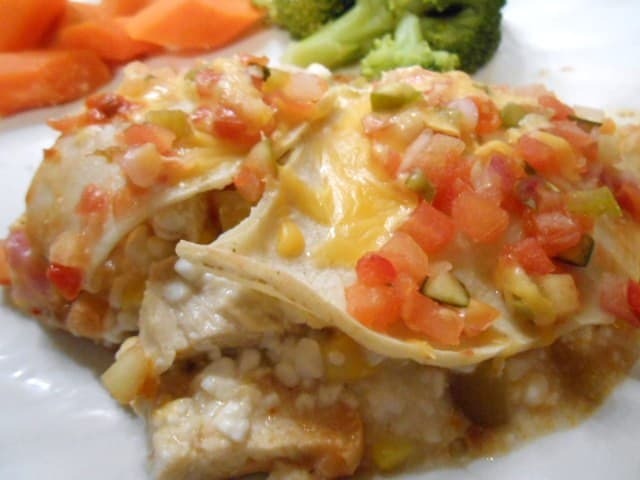 So if you’re on the Weight Watchers plan or even if you’re not, you must try this recipe. It’s healthy, filling, and very tasty! Bon Appetit! Or in this case, Buen Provecho!! Wanna see more posts like this delivered straight to your Inbox? Go to the Subscribe box at the top of our blog and enter your email address! Also, share this post on Facebook, Twitter, and Pinterest. We really appreciate it! Wow Pam…You sure made me and my recipe sounds great!!! Thanks you so much for the kind words about my site. You did a great job with my Skinny Lasagne Ole! Thank you so much Nancy! 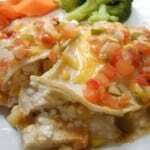 You have no idea how much I appreciate finding delicious and filling Weight Watchers friendly recipes. I will be back to visit often. I am most definitely making this recipe. It looks amazing! Thanks for sharing. Yum, that sounds really good. I am going to have to try this! You have solved my dinner dilemma for tomorrow night. This looks great. I have to agree Weight Watchers is such a good plan to learn how to eat healthy and enjoy the things you like!